I caught a flu bug recently, and was down ill for a few days...I am still recovering, so I haven't had much Miniatures updates lately. So for today, I decided to do something different. Besides making miniatures, I also love cross stitching. I started cross stitching since I was 10 years old. Recently, I have worked on my work in progress very regularly again. This is a piece by Sandy Littlejohns. 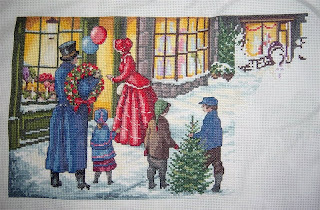 It is named "Victorian Christmas Eve". This chart is actually a 3 part horizontal chart. I have just completed 1 out of the 3 part series, and am now working on Part 2. I can't wait to see how it turns out. I may attempt to do another marvelous chart of hers after I complete this. Here it goes again! Another week has passed by. I really enjoy the Show and Tell Monday organized by the ladies of MakeMinePink. It is a chance for us to showcase our work in progress, or any great antique buys, anything. This week had been fruitful for me. 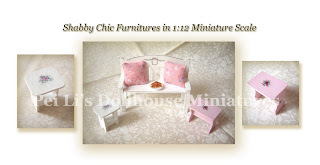 I finally managed to finish a few furnitures in 1:12 dollhouse miniature scale that I have been building for a while, by adding finishing touches to them. 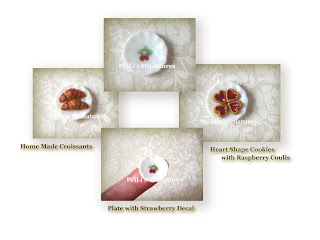 I like the new look on them myself, because it brings out a soft romantic look..
Next, I also experimented making some other food items, as well as decorating a normal white porcelain plate with a strawberry decal. This was a tea cup saucer, but it fits the small food items perfectly. I took a photo of the plate on my finger, so you have a perspective of the size of it. All are in 1:12 dollhouse miniature scale. 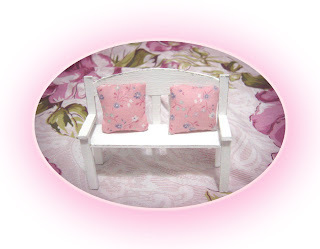 This is a "Shabby Chic Bench" work in progress...I planned to make another miniature set. I might have to shelf this piece for a while, as I just received an order. One of the things that I constantly face, as an aspiring miniature artisan is wondering what else I can do, how else I can push myself a bit further. Through exploring and experimenting, I get to know myself better, and knowing what I enjoy doing most, and what I want to focus and specialize in. This piece which I am going to introduce to you, is one defining moment for me. 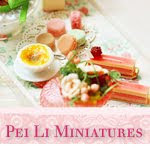 The reason is because I never thought I could look at a photo, and attempt to re-make it in a miniature scale. I think this is what I would like to pursue further. It gives me tremendous joy when I am able to capture some of the original feel, re-create it, and use some of my creativity to tweak it further. I came across one of her photos in there, and immediately said to myself that I wanted to make this into a miniature scene. When I first started making the white picket fence, I was nervous. I did not know if the scale was going to be all right, if the measurements would be right. When making miniatures, one wrong cut means you got to re-do some of the parts all over again sometimes :S For this piece, I made the picket fence twice. The first time I made it, I felt that the fence was too short and after adding the flowers and shelf, it would look too tight. One of the things I truly enjoyed making this piece was developing a systematic process to put this piece together. Should I glue it first, or paint it first? These are the type of questions I often ask myself. Often than not, there is just no hard and fast rule. Trial and error is what I do a lot. I loved painting and adding texture to this. I like giving it a little vintage look. A bit of wear and tear gives it character! After all that is done, I think about how to decorate it. I started making flowers, and adding some lovely dried leaves that give it a beautiful feel. I could not follow Cindy’s photo entirely because I didn’t had an assortment of tea cups in my collection, so I had to come up with something else. As I looked at the picture, and try to create it, a story came into my mind that fuels the creativity. I imagine a lady (probably Cindy!) enjoying the roses in her garden, delicately selecting a few beautiful blooms and putting it into her white pitcher. To add some more realism to it, I made a few petals and have it scattered on the ground. 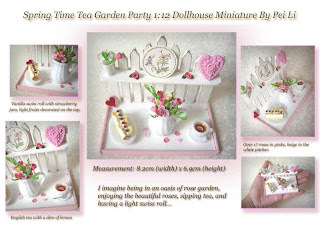 Being spring time, she wants to enjoy a cup of tea while admiring her roses. What is tea time without food?? LoL. Now, I had to think hard here. Do I want the heavy, rich filled cake, or something lighter? I felt something light would be much more appropriate; hence I selected a swiss roll. Vanilla swiss roll with strawberry jam, decorated with light fluffy whip cream, slices of strawberry and orange on the top. What I really do like too, is the little white cup with a single stalk rose. I made some transparent color enamel so that it resembles water, and put the rose and dried leaves in. If you look into the cup, you’ll see that the hardened water is transparent. The best part of it all, is nothing is glued in place, except for the swiss roll on the plate, and the single stalk rose in the cup. The roses in the pitcher can be removed, so you can play with it and do your own flower arrangement the way you want to. 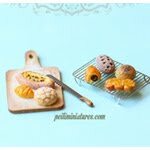 It also means that you can swap the things around and arrange it in whatever arrangement you like. It’s little things like this that I think people will like – having the room to play with it. There are a few things you would have noticed different from my initial blog. First of all, I have my own Blog Banner up! 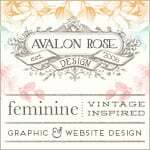 Thanks to Roxie of Business In THE Bag who helped me design my logo. I love it...!! I have been busy building inventory. It's coming along nicely. I'm so excited by the progress and the ideas I have for the big opening. I have also completed my homework for May workshops, except for some wood which is not found locally. 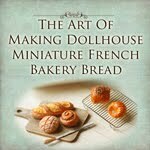 I'm attending some crash courses overseas to ramp up my knowledge and skills in miniature making. I am always so excited and looking forward to these courses, because I am often so inspired and awed by the new things I learn. Of course, I get to transfer my new skills to make other new creations! April and May will definitely be a busy period for me, but I'm amazed I am still very happy going through all of this.